Tomato onion curry for chapathi & rice or onion tomato gravy for chapathi or rice is super easy to make and it is delicious and healthy as well. Tomato onion curry is also popularly known as thakkali ulli curry for chapathi in Kerala, South India. This is a simple and popular curry from Kerala which is enjoyed with chapathi, poori etc. This simple and easy tomato onion curry recipe is very flexible and you can easily adjust the flavors as you wish. You can make it very mild curry, medium or spicy as you wish. And you can use your favorite spices as well. We use garam masala powder as one of the most flavoring spices to make this onion tomato gravy or curry. You may also try curry powder instead if you wish. Make sure to use ginger garlic paste (or freshly crushed garlic or grated ginger) for the best results! If you add many tomatoes, the sourness will be more, so in my recipe I am using the right amount of tomatoes so it won’t be too sour. However if you don’t like sourness at all, you may add a spoon of sugar or jaggery to reduce the sourness. This is popularly known as ulli thakkali curry (tomato curry with onions) in South India and Kerala where thakkali is tomato and ulli means onions. 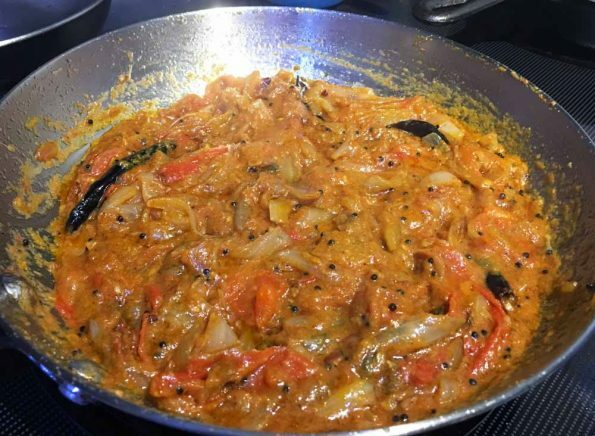 We do not add any water to this tomato onion curry recipe, as the juice from the tomato is enough for the gravy which is thick. 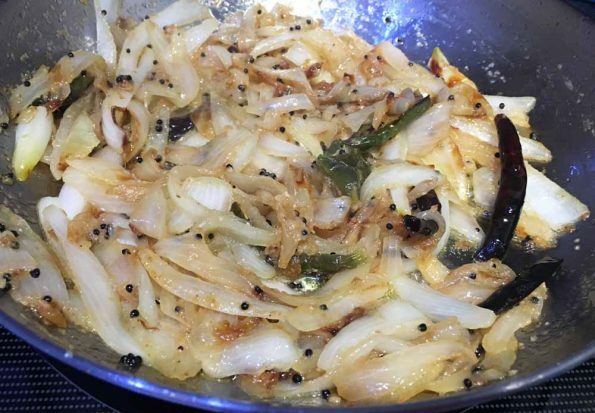 I have already added curry recipes for chapathi using just tomatoes and just onions (not a mix of both). You can see those posts below. By combining onions and tomatoes, this tomato onion curry is more healthy but it is still very easy to do as well! 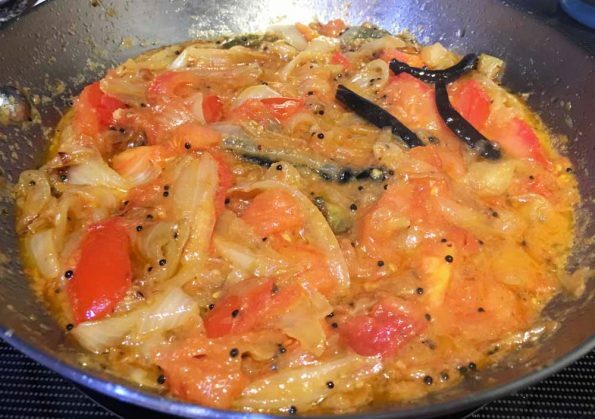 So let us see how to make this easy, healthy and yummy tomato onion curry for chapathi, puri (poori) or rice following this easy tomato onion curry recipe. This tomato onion curry for chapathi (or onion tomato gravy for chapathi) is great to be used as an easy and simple side dish with chapathi, poori, rice or even dosa as you wish. Peel the onion and slice in long slices. Heat a pan and add 2 tablespoons of oil. Add mustard seeds and when the mustard seeds splutter, add the red chilies. As the red chilies are fried, add the green chili and lightly fry. Add the onion slices and saute for about 2 to 3 minutes. Add ginger garlic paste and salt and mix everything well. Saute the onions in ginger garlic paste for about 6 to 8 minutes or until the onions are sauteed and transparent in color. (you don't have to brown the onions). Keep stirring occasionally to avoid the onions sticking to the bottom of the pan. Meanwhile cut the tomatoes in long slices and keep aside. After the onions are sauteed, add the sliced tomatoes and add salt (if required) and mix well. Add the extra 2 tablespoons of oil and mix to blend everything with the oil. You can saute the onion tomato mixture for about 2 to 3 minutes or until the raw tomatoes start getting cooked. If you don't want the tomatoes to be mixed with the curry, you don't have to saute it much as the tomatoes will blend with the curry very fast. Since we are making the tomato onion curry with some gravy, we can saute them for little longer so the tomatoes will get cooked and the juices from the cooked tomatoes will make up for the gravy. I recommend cooking the onion tomato mixture for about 4 to 5 minutes or until the tomatoes are soft and the gravy is made up from the juice of the cooked tomatoes. You can wait more time until the gravy starts separating itself from the oil which will be perfect. Add all the spices, mix well and saute for another 1 minute. Now your tomato onion curry for chapathi or rice is ready to serve! If you don't have ginger garlic paste, you can use freshly crushed ginger and garlic. 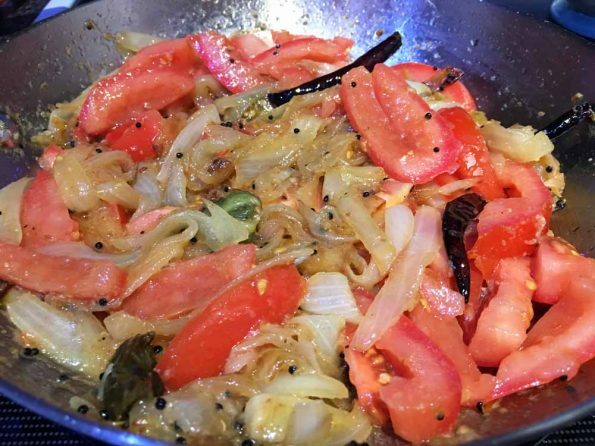 Enjoy this easy tomato onion curry as a healthy and delicious side dish for chapathi, poori, rice, or even idli or dosa. Hope you found this post on onion tomato curry or gravy for chapathi or rice helpful!